Poppy Cottage01263 715779work01603 870304fax Self-cateringPoppy Cottage is a charming terraced Victorian cottage, that is part of a recently refurbished and historic workhouse, situated in the popular west Norfolk village of Docking. With its own private, well-stocked garden and further communal grounds, the cottage has much to offer; a modern well-equipped kitchen and spacious sitting room on the ground floor with two double bedrooms and a bunk bedded room on the first floor. One bedroom has an en-suite shower room and there is an additional family bathroom. Docking is a well served village with a shop, pub and a popular fish & chip shop and is a great starting point for exploring the beautiful coastal regions of west and north Norfolk, which host national bird and nature reserves, the Norfolk Coastal Path and some stunning beaches. Inland delights are the Georgian village of Burnham Market, the Norfolk lavender fields at Heacham and the historic houses of the Royal Estate at Sandringham and the seat of the Earls of Leicester at Holkham. • General: Oil fired heating, charged Oct-Apr @ £30pw, pob. Poppy Cottage offers weekly bookings starting on Saturday. 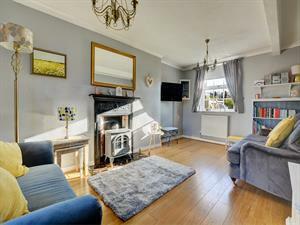 Poppy Cottage is a charming terraced Victorian cottage, that is part of a recently refurbished and historic workhouse, situated in the popular west Norfolk village of Docking. With its own private, well-stocked garden and further communal grounds, the cottage has much to offer; a modern well-equipped kitchen and spacious sitting room on the ground floor with two double bedrooms and a bunk bedded room on the first floor. One bedroom has an en-suite shower room and there is an additional family bathroom. Docking is a well served village with a shop, pub and a popular fish & chip shop and is a great starting point for exploring the beautiful coastal regions of west and north Norfolk, which host national bird and nature reserves, the Norfolk Coastal Path and some stunning beaches. Inland delights are the Georgian village of Burnham Market, the Norfolk lavender fields at Heacham and the historic houses of the Royal Estate at Sandringham and the seat of the Earls of Leicester at Holkham.